Research into digestive issues is uncovering links between what we eat, and other diseases such as diabetes. In an interview with Digest This! 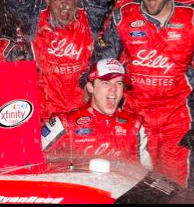 Magazine, NASCAR Xfinity racer Ryan Reed, driving for Roush Racing and sponsored by Lilly/American Diabetes Association, shares his story on how he dealt with the disease. With a strict regiment of healthy eating and fitness program, Reed manages his diabetes and convinced NASCAR to keep him in the driver’s seat. Read the entire article from this link: Digest This! Magazine.